Despite having been debunked numerous times, the global cooling myth still lives on, most recently as part of a column by George Will. Hopefully a new paper by David R. Easterling and Michael F. Wehner published in Geophysical Research Letters will finally kill this myth. 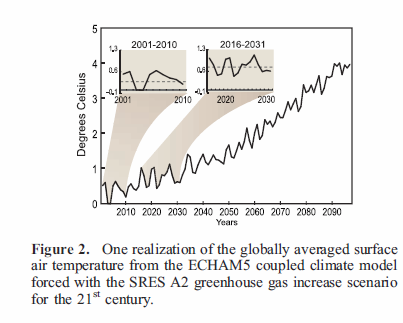 Of course given the outright dishonesty of deniers, I don’t have high hopes for this, but at least this paper will serve as a direct rebuttal of anyone foolish and dishonest enough to continue to claim that global warming has stopped or that the earth is now cooling. And here are three figures from the paper that make this point abundantly clear. 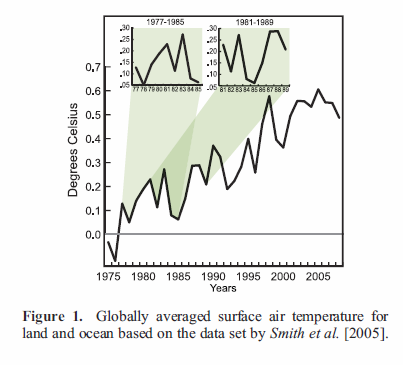 The first two figures highlight periods of no warming in both the instrumental record (fig 1) and model predictions (fig 2). 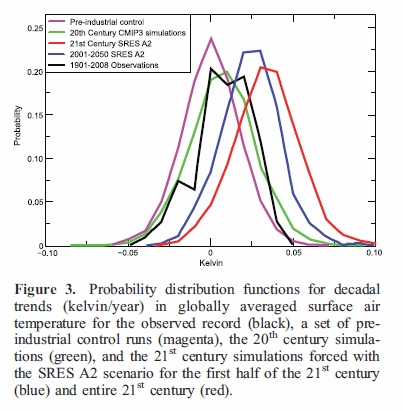 The third figure shows the probability distributions of decadal trends for the pre-industrial era, the instrumental record and various model runs. Notice how the bell curve moves to the right (thus making decadal warming trends more likely) as we move forward into the future, but that there still exists the possibility for a decadal cooling trend. The reality of the climate system is that, due to natural climate variability, it is entirely possible to have a period as long as a decade or two of ‘‘cooling’’ superimposed on the longer-term warming trend due to anthropogenic greenhouse gas forcing… [and] it is clear that the models can and do produce sustained multi-year periods of ‘‘cooling’’ embedded within the longer-term warming produced in the 21st century simulations. Therefore, it is reasonable to expect that the natural variability of the real climate system can and likely will produce multi-year periods of sustained ‘‘cooling’’ or at least periods with no real trend even in the presence of long-term anthropogenic forced warming. Claims that global warming is not occurring that are derived from a cooling observed over such short time periods ignore this natural variability and are misleading. We all know that it gets warmer in the summer and cooler in the winter in the Northern Hemisphere, so no one would dare use a temperature trend of half a year to reach a conclusion about global warming. Looking at five or even 10 years can lead to similar errors. Yet otherwise intelligent critics continue to do just that, even after the problem has been pointed out to them. It is foolish for anyone to claim that models expect global temperatures to increase monotonically, they don’t. Cooling trends that last for a decade or more are not only completely consistent with global warming, they are to be expected, and anyone who assigns any importance to these short term fluctuations is either dishonest or ignorant (George Will I am looking at you). Either way they shouldn’t be listened to. The point is, that you feel we can change the weather. Even if this were possible, it’s not likely that humans would do the right thing anyway. We need more food and food grows by way of CO2. I’ve seen plants double their size. (Even more!) Plants absorb CO2. So are we really in any danger? No. Unlike Venus, the Earth has coping mechanisms. And the opposite is also true and evident in the historical record. There can be periods of warming during a long term period of cooling. Only our great grand children will know the answer. No one here is talking about the weather. And no one is talking about feelings either. I am talking about the fact that according to the scientific community our GHG emissions are having a measured effect on the earth climate. Of course while CO2 may have some beneficial properties for some plants, the situation is ultimately anything but certain. I suggest you read up on Liebig’s law of the Minimum. Really this is rather basic stuff. Lets just say I don’t believe your claims of plants doubling in size. Not for a second. The paleoclimate record shouts out to us that, far from being self-stabilizing, the Earth’s climate system is an ornery beast which overreacts even to small nudges. So yes there is reason to worry. Yes that is technically true; science cannot prove that our understanding of anthropogenic global warming is correct. The same can be said for evolution, gravity or any other scientific theory. But having said that science can tell us the likelihood that our understanding of AGW is correct. And the odds are pretty damn convincing. Please email me the full article. Thank you. Great, so what you are really saying is that we can cool for 20 years, by which time a lot of people will have retired very nicely thank you on their carbon taxes (Mr Gore), but that in no way changes the general warming trend…. which is the warming trend from the LIA that started before large scale CO2 emissions. STILL don’t see where CO2 fits into this, you are just discussing temperature trends which I’ll happily accept, but causation theory is still all about correlation and statistical manipulation. No, what I am saying is that, given the noisy nature of the data, any short term cooling could simply be part of the noise and not part of the overall trend. Of course such cooling could be the start of a new trend, but it will take more observations, before such a trend can be separated from the noise. All this paper says is that if CO2 is causing warming then short term cooling is not only consistent with the theory and models, but is to be expected. This paper doesn’t deal with the evidence behind AGW, there are plenty of other papers that do. but causation theory is still all about correlation and statistical manipulation. Thankfully AGW doesn’t depend on correlation for causation. has a fundamental methodological flaw. “..more [insect] adults would migrate to the high CO2 plants,” – DeLucia said. So, different test fields did not have isolated ecosystems, since insects were allowed to migrate from weak plant to rich plants. This negates the whole study. Everyone likes better food, it is hard to expect anything other than that. Garbage in, garbage out, sorry. This is a typical hack job by AGW opportunists. No it doesn’t. Learning about preference is very useful in attempting to predict the consequences of a change on a particular ecosystem. That being said it does indicate the difficulties in accurately predicting what will happen to plants in a higher CO2 world. Which is why I say that the situation (in regards to plant productivity) is anything but certain. But you should have read the whole study, particularity the part about the fact that high CO2 plants made less of a defence chemical and this allowed the Japanese Beetle to live longer and produce more offspring. This suggests that as CO2 increases so might the population of Japanese beetles, and this would negatively impact agricultural production. Of course there may be other factors that negate this effect (or amplify it) which is why I continue to stress that we don’t yet have a firm grasp on how agriculture will respond to increased CO2 levels. But I guess it is easier to believe that any study that shows a negative effect of CO2 is a hack job that should be ignored. It’s all just a big conspiracy! But enough of this. This post wasn’t about agricultural productivity under increasing CO2 levels, it was about the fact that a short cooling trend is completely consistent with AGW models and theory. No, there are no difficulties. It is an experimentally established fact that important agricultural plants grow bigger in CO2 enriched environment. It is an established agricultural technology, period. The agriculture also knows means how to defend crops against insects. The methodologically-crippled pseudo-scientific article is not a conspiracy, it is an understandable response of business of research to the current fad conditions. Everyone likes better food and better grants, and they have families too. You keep arguing about “overwhelming consensus”. Allow me a not-so distant parallel: During Stalin dictatorship and Lysenko’s “biological inheritance principle”, there was a consensus too. Every educational facility and agricultural institution in the country would run experiments in full conformance with “leading” theory. The consensus was completely overwhelming, literally, because all vocal skeptics were terminated in Gulags. Ok, let’s stay on topic. A question for you: how long do you expect the “natural climate variability” to mask anthropogenic signal? We have already about a 30-year period, 1940-1970, good. How about this: ice cores show a saw-tooth variation in temperatures and CO2, that lags temperature changes by about 600-800 years. Assuming that we could filter the noise of 30-100 years long, we will have a clean saw-tooth curve, for both T and CO2, and one curve will be shifted by the established 800 years. Now, each of deglaciations will terminate at some point in time, when temperatures would stop rising, and would begin to decline into a new ice age. This is what the records show, it is a fact. Now consider the behavior of CO2. It lags by 800 years. Therefore, when T already begins to fall (with a negative trend for 800 years), the CO2 would continue to rise, with uptrend, for a good half of millennium. This is what the ice records show. In fact, the time from the last termination looks about right for this counter-trend to occur, as it has happened many times before (and without any help from us humans). So, when would you expect the alleged anthropogenic signal to take over this natural variability? No, there are no difficulties. It is an experimentally established fact that important agricultural plants grow bigger in CO2 enriched environment. And with that statement you are ignoring the many ecological responses (such as a diminished ability to produce defence chemicals), that could negate any potential increase. It also ignores Liebig’s law of the minimum. You cannot simply discount the several papers I cited showing negative consequences of increased CO2 on plant productivity. Such disregard for evidence that contradicts your points will not be tolerated. The methodologically-crippled pseudo-scientific article is not a conspiracy, it is an understandable response of business of research to the current fad conditions. Thank god science doesn’t actually work that way. If it did it wouldn’t do anyone much good. Scientists are highly incentively to prove established science wrong. And there is plenty of money available for people who dissent with AGW (just look at how much money Lindzen, Singer, Ball and others have made as contrarians). Claiming that there is a shortage of money for people denying climate change flies in the face of reality. As for your comparison to Lysenkoism, surely you can see the difference the scientists of the Soviet Union and those of the free. Academic freedom was not one of the strong suits of the Soviet empire. And as I have explained before science has and will make mistakes, but its track record is second to none. A question for you: how long do you expect the “natural climate variability” to mask anthropogenic signal? We have already about a 30-year period, 1940-1970, good. Except the mid-century cooling trend wasn’t due to natural variability. It has been attributed to the aerosol forcing caused by the post war construction boom. And yes climate models to replicate this cooling remarkably well. Again the reasons for shifts in past climate aren’t entirely understood. The fact that CO2 in the past has lagged temperature is not a new revelation, and it doesn’t contradict the basic radiative properties of CO2, or AGW. That sounds like you are saying that CO2 does not correlating with temperature. But CO2 does correlate with temperature, quite strongly too. But I am curious as to how you predict when this ‘counter-trend’ is going to occur. Are you saying we are headed for an ice age? I hope you did more than eyeball it. So, when would you expect the alleged anthropogenic signal to take over this natural variability? Not exactly sure what you are referring to here. The warming signal has indeed been detected, and it has been attributed to anthropogenic GHG emissions. I certainly hope you aren’t suggesting that the increase in temperature over the past 100 years is just natural variability. Because that would be foolish. And even this isn’t really on topic, given that the paper doesn’t even attempt to deal with the paleoclimate record. All the paper states is that a short term cooling trend is completely in line with model predictions and AGW theory.